That will tell py2exe which part of PyOpenGL to include. Otherwise you have to copy them over manually. Be sure to have the try and except around all win32 imports so your program remains cross platform. For one of my current projects I'm using rabbyt in conjunction with pygame. With the default texture loading, if your image dimensions are not powers of two your resulting sprite will be blurry. Pyglet fixes this by creating a new texture with correct dimensions, blitting your image onto the texture and then setting the texture coordinates. That way OpenGL doesn't do its blurry scaling job on your image. Well, pygame's texture loading doesn't do that. So you either go to great pains to make sure all your textures are powers of two (which can be annoying when you don't want your sprites to be those sizes) or do the coordinate mapping manually. Find the next power of two. Gondola was our pyweek 7 entry. Based on feedback there and elsewhere I have concluded that, at least when it comes to Gondola, there are four types of players. 1. Those that wanted to optimize their networks. A player from this group can spend hours playing on just one map, trying to make things run better. The ideal group to be in to enjoy Gondola. 2. Those that wanted to solve a puzzle. They lay out their networks and then they're done. Either they don't realize it or it just doesn't appeal to them to go back and optimize their routs. Keeping these players going takes a lot of large and complex maps. Maps also require some sort of goal; something to work towards and be able to fail at doing. Which is something Gondola's current selection of maps does not provide. 3. Those that just want explosions. Gondola is similar to simcity in the sense that it is a simulation and a toy. There is no real goal other than to do better that you have before. But one thing that Gondola doesn't have that simcity does is explosions. There are no futureistic robots that come and wipe out your infrustructor. No fires, tordadoes or anything else destructive. 4. Those that just didn't get it. I guess the game, for some people, isn't explained well enough. I don't blame them at all because the tutorial really isn't that comprehensive. I wish I knew in what way they didn't get it though, so I could address the confusing aspects. A game, idealy, should not require any explination or even a tutorial in order to start playing; Something I am still trying to figure out how to do. One problem I was continually having with SnowballZ was zooming. The further you zoomed out the slower it went (as, obviously, it had to draw everything). To the point where zoomed all the way in would give me 120fps and all the way out 30fps. Unacceptable. I started working on making it fade into a paper-looking map when zooming out; So I could strip out the trees and terrain. But on the fly cartography that looks even half way decent is a lot of work. That's when Matthew suggested rendering the entire map to a texture. Bingo. I created a function that set the viewport to cover the entire map and rendered just the terrain, trees and other decor to an off-screen buffer; Which I then saved to a texture. Now when the player zooms out to a certain point it switches to drawing that one texture which, compared to a 80,000+ vertex terrain and a couple hundred trees, is much faster. The one drawback of this method is that it isn't perfectly seamless. But you wouldn't notice the difference unless you were looking for it. I rendered to a 1024x1024 texture so it is a little blurry when you use it too close up. This could be solved by rendering it to a larger texture but my concern comes when you have a map that is bigger than my 150x150 tiles (odd number, I know). # Snipped. This is where I render my map. See lib/map/display.py for full code. Using this method requires a certain OpenGL extension that older hardware might not have. You are also limited to a max texture resolution. Which could be an issue when it comes to large maps, even on newer hardware. A method that avoids both of these problems is to split up your prerendering of the terrain into sections of 512x512 textures. That avoids the sharpness problem. As long as your section resolutions are smaller than your screen size you can render them to the backbuffer and copy that to a texture, which avoids GL extention problems. # (Snipped) Render your map here. Having the penguins share your emotions is a great way to connect with the player. When your little posse is outnumbered 4 to 1 your penguins don't like it any more than you do! In fact, as they aren't exactly the most mature little creatures, they'll get down right angry. To the point where they will throw their snowballs faster, harder and further. When your on the wrong end of the deal you might find it a little annoying how these little guys don't even take time to aim. 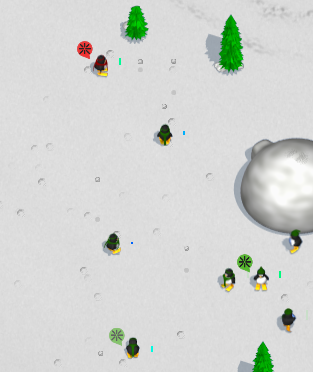 Normally that would be a good thing but each snowball, even when thrown just in your general direction, will hit at least one of your penguins. Run my little penguins, run! For the next release of snowballz I'm trying to simplify the user interface for two reasons; So it's easier for players to learn and secondly (and most importantly at this point) it's easier for me. One issue I've always had with controlling the penguins is the run mode. In versions 0.9.x, by middle clicking you tell your penguins to run without stop, regardless of enemies, to where you send them. A great way to get your snowballers behind enemy lines. Apposed to if you were to just right click, in which case they would stop and throw snowballs at enemies. The one problem I've had with this method is that it isn't obvious. No-one would ever discover it, which could be frustrating. That's when I remembered hearing about an article talking about networking RTS games. One interesting thing that the article mentioned was to filter out rapid clicking; As players tend to repeatedly tell their units to go to one spot as if it made them get there faster. Thus saving network bandwidth (it was an old article written when most people had dialup). So why not use this behavior to do what the player expects? So I got rid of the confusing middle click and set it so that when a player rapidly tells their penguins to move it adds a double arrow to the move icon (which specifies run mode). And their penguins will run through the middle of a snowball fight without stopping until they get to where you sent them. And there we go. The run feature will be discovered just by playing. It doesn't have to be in a tutorial or tips & tricks. Now let's see if I can get the rest of the interface like that.